The Frenchies have done it again. 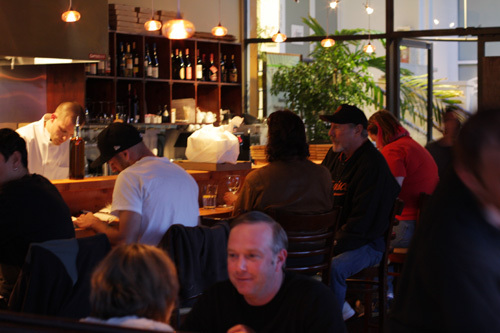 From the same owners as Chez Papa Resto, Chez Papa Bistrot, and Chez Maman, Pizza Nostra has hit the ground running -- delighting lucky Potrero residents with truly great pizza. Seems like SF just can't get enough of the 'za. With stiff competition like A16, Pizzeria Delfina, and Little Star Pizza in the city, the heat is on…but Pizza Nostra holds its own with Pizzaiolo Giovanni Aginolfi at the helm. Aginolfi has 18 years of experience under his belt, including placing 5th at last year's World Pizza Championship. One taste of his pie and you can see why. Thin crust with just enough crisp and crunch. Smooth, chewy, flavorful dough -- made with tipo 00, of course. And an impressive range of gourmet toppings like prosciutto di Parma, lamb sausage merguez, and even a four cheese bianca made with sweet gorgonzola and pear. The standout of the night that floored us and left us with that lusty, satiated, glow in our eyes was the Cannibal pizza. 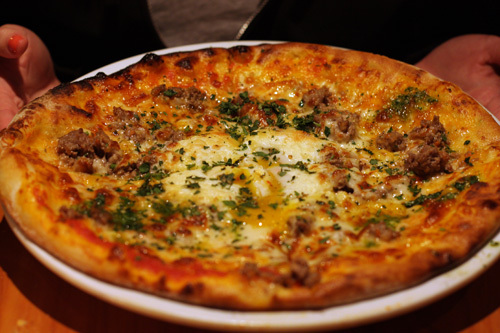 Topped with tomato, mozzarella, chunks of full-flavored ground beef, oregano...and crowned with a single egg cracked on top, baked to soft perfection so that the golden yolk spilled out in a lava of velvety richness. Brilliant. Yes. More please. This hussy of a pizza (and I mean that in the most complimentary way) was presented with a bottle of house-made, chili-infused extra virgin olive oil, which our server encouraged us to "flavor" our pizza with. As the pizza itself was noticeably free of any residual oil, I was tickled by this fancy pizza-grease-on-the-side option. Pizza Nostra's spicy dipping oil is like the classy cousin to your late-night joint's neon orange drip and chili flake confetti. The creative flavor combinations on the well-crafted menu made choosing just one or two pizzas difficult. There is something for everyone, from the seafood laden Pescatora featuring prawns, clams, and calamari, to the classic Caprese dressed up with prosciutto and arugula. And don't forget the variety of salumi, cheeses, and small plates on the menu. 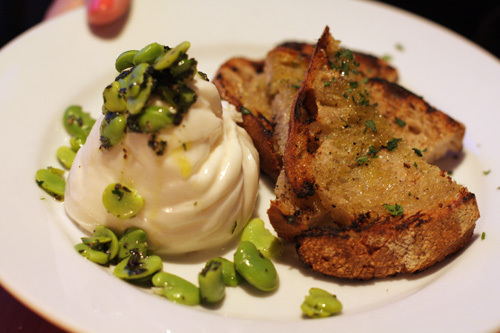 My favorite was the Burrata, a generous portion of creamy, soft mozzarella served with tender fava beans and a delicate and refreshing mint pesto. Pizza Nostra is the new kid on the block of already established heavy hitters, but she's already running smoothly and is fast becoming a destination spot for pizza lovers. With a winning recipe of authentic Neapolitan-style pizza, beautifully presented tasty starters, and a cool urban/rustic vibe (plus spacious outdoor seating for dining al fresco), I'm expecting a long run of greatness for Pizza Nostra. So what are you waiting for? Mangia!